Sunday March 27- 1932. I lay in bed all day and was more comfortable. Hattie brought my dinner down and was here till after supper Rob took her home. I took bath and to bed. Monday March 28- 1932. I had a bad night. Hattie came down for the forenoon. But I insisted she go to her club meeting at Mrs Steindles in the afternoon. Mary spent the PM with me. Ott was here later. Hattie stopped here and Rob came for her. Dr Ned Smith was here in the PM. There was nothing else he could suggest in my treatment. William here in the evening. I got such a good picture of LeGrand. Wrote Emma Herriott & Ella Nagle. Tuesday March 29- 1932. This is Bro Lees birthday he would have been 70 years old. It was 14 years today since Will and I left Oklahoma City together the last time I slept better last night than for a long time. I wrote LeGrand in the AM. Hattie here in PM. Ott here too. Weather warm Wrote Laura in evening. Birdie writes Jim Cameron had a stroke yesterday. Wednesday March 30- 1932. Hattie came down early and The Hunters called to take her to Marengo to a church meeting for the day. I felt very good. 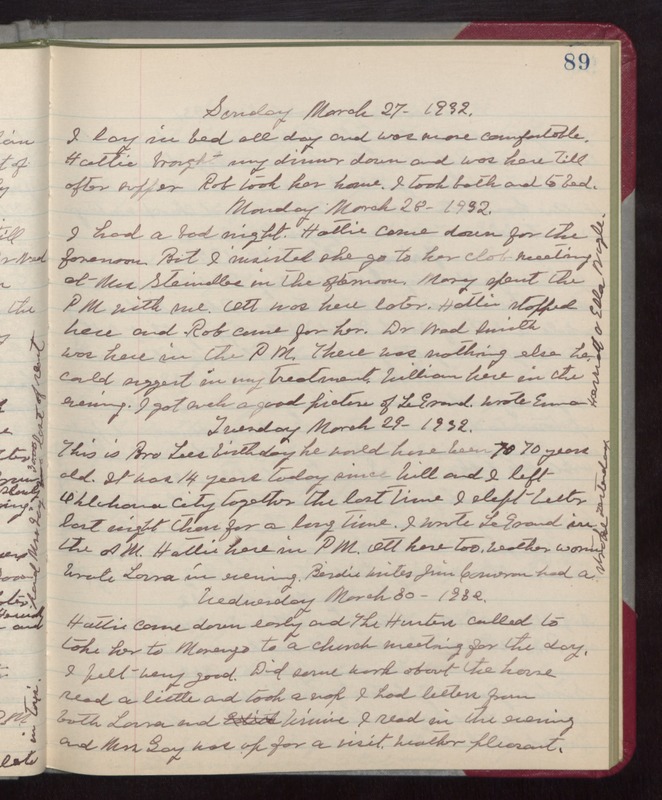 Did some work about the house read a little and took a nap I had letters from both Laura and Winnie I read in the evening and Mrs Gay was up for a visit. Weather pleasant.